I thought I'd write about some of the sewing tools that I really love. To first understand why I love it so much, you should know about the old tippy ironing board I had from target for many years. The grooves where the legs slide through to put the legs up or down had a channel on the opposite side. To be more clear, as steam condensed under the ironing pad, it would drip into this channel and cause a pile of rust. Since I always stick pins into the ironing board when doing things like ironing bias tape or pocket flaps, I just knew they were getting stuck through the pad to rust city. I don't know about you, but I'm not a fan of tetanus, and I hear seamstresses do get it. Some of us stab ourselves a lot during sewing projects....and it's not just a surface scratch! Finally, I'd had enough. I decided to look for the biggest and best ironing board I could find...on amazon.com so I could get free shipping. I settled on the Rowenta professional ironing board. This means my ironing board is wider (a lovely 18.5" wide!) than the average one you buy at Target or similar store. SO AWESOME. So much more ironing and project surface. I can never go back EVER!!! It's 53" long not counting the iron rest on the end. It has a cord holder that keeps my iron cord out of my way while I iron. It has the metal hot iron holder with ?silicone? heat resistant thingies on it. The iron holder has a little bar you can put hangers on....or hang your bias strips or press cloth...or whatever you want! It has a treated metal surface that is supposed to resist rust. The top of the leg tracks are flat so no more water and rust collector! I checked under the pad first thing to see if this was designed better than my old board. It has heavy duty legs so it's not tippy!!! Amazon.com says it weighs 24.2 pounds if that gives you an idea. It has a nice thick ironing cover/pad. It does shrink a little in the dryer though, so beware! I wrote in more detail about how they are made in my post about Peggy's Place Mats. The only thing different about these is that they are not home dec weight cotton. To give them a little more body, I interfaced the back side of the top. So, in this photo, the pear fabric is interfaced with fusible lightweight interfacing. I absolutely love these pears and they will go wonderfully in my Grandma's kitchen. Polka-dots are her favorite, so I used those for the back. 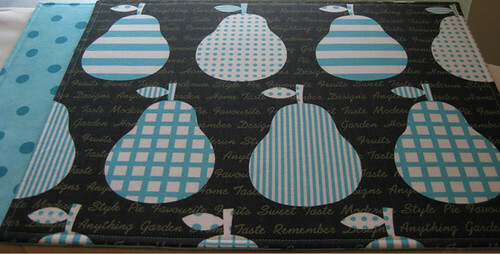 The pear fabric is by kokka and the dots are a from Moda's "It's Snowing" line. I had originally purchased the dots for some holiday season bags, but it just went so well with the pears, that I had to order more. I pinked the top fabric's (the pears) seam allowance to reduce seam bulk which shows through more on lighter weight cotton. I taped two pieces of template plastic together so that I'd have a big enough piece to cut a 19" x 15" rectangle (finished place mats are 18" x 14" with a 1/2" seam allowance). Not only was it easier to cut out the place mats with the template, but it allowed me to choose the most appealing section of the fabric to cut. I wanted to make sure that I got two full rows of pears on each place mat so I aligned my see-through template on the fabric until I was happy, then I cut! Update: My husband is my official place mat stuffer and he just reminded me that he finds place mats with interfaced cotton much harder to stuff than "un-interfaced" home dec weight ones. The interfacing causes a lot more friction as you try and shove the peltex into the place mat. Something to keep in mind! I've had a great day of browsing through other crafter's creations. I just found the most lovely knit cupcakes on Little Cotton Rabbits blog. She has the most beautiful knit crafts. When you visit her site, you must check out her little knit animals as well. The bunnies are adorable!! If only I knew how to knit!! I would love to make these. 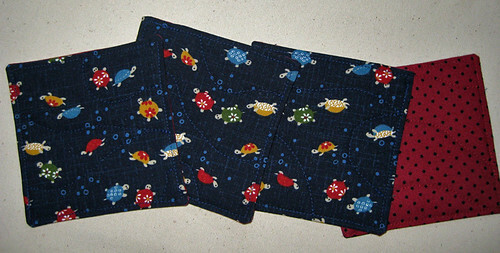 Fortunately, she is kind enough to share her pattern for these which you can purchase at her Etsy shop. I will be buying it as motivation to learn knitting. =) Oh, my craft to-do list is growing longer by the day!